This may be my last blog entry. I like writing, but let’s face it–I don’t write that often, and I don’t really say much. About six people read this stuff, and frankly there are a lot of better food blogs out there. I don’t blame them. There are blogs with lessons, and videos, and lots of pretty pictures. The ones that get read are typically written by people who write daily. They are more inspired on a regular basis than I am. They cook at home every day, and they document their experiments and explorations. There are blogs that are maintained as a revenue stream for people selling food products, books, lessons, and equipment. And some that are just cashing in on the “clicks” from the ads they allow to post on their blogs. I have ads on mine and since July 2008 I have proudly netted exactly $2.63! Thanks guys! Then there are the cookbook blogs. Ever since that Julie and Julia movie came out there are people all over the globe cooking their way through one book or another and documenting every ingredient, every failure, every shopping trip, every dollar spent, and every cute little expression that the dog has on it’s face while they are beginning their third attempt at the dish at 3 am…ad infinitum. Seldom if ever are these literary giants actually culinary professionals, but some of them should be! The most popular one out there to date has got to be the Alinea cookbook. 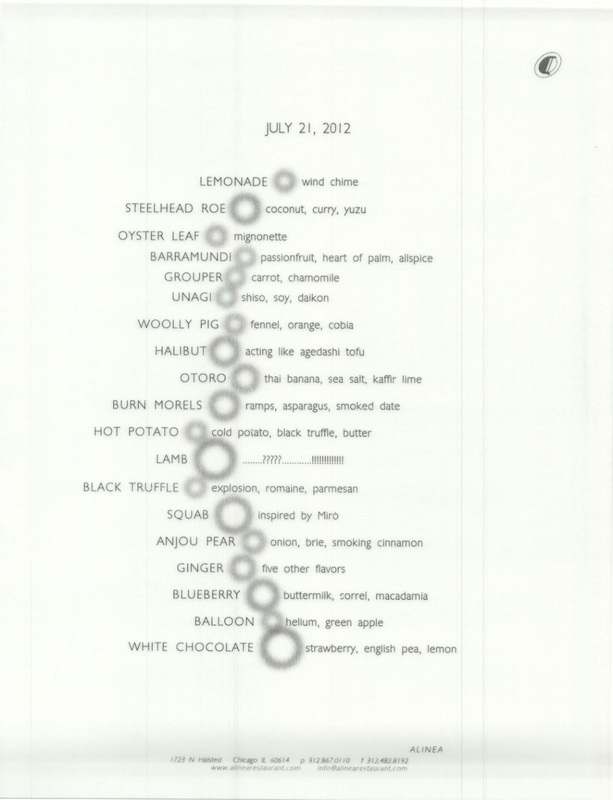 A Google search for “Alinea cookbook blog” netted 214,000 results. Now not all of those are blogs about the book, but a bunch of them are. I’ve browsed quite a few of them and I’ve been surprised by three things. First, many of the authors have never been to the restaurant. Second, most of the authors are not chefs but mere hobbyists and foodies. And lastly, most of them have been able to reproduce the recipes in the book fairly accurately. I don’t make these comments as criticisms! Far from it. What I find amazing is how one chef and one restaurant has had such a magnificent impact on food in America! Such an inspiration to foodies the world over. I perused the book on a friend’s coffee table some 5 years ago and thought that this was not food as I then knew it. This was something much, much different. Just a few days before seeing the book I was told that a mutual friend of ours had done a stage at Alinea, and I had ask, “what’s an Alinea?” After having the Chicago eatery introduced and explained to me I wanted to go shake our friend and reprimand him harshly for turning down an opportunity to stay on full-time. Still it wasn’t until 3 years later that I bought the book myself, another year before I opened it, and only a couple months ago I tried my first recipe from its pages. That one failed, the next one failed, the next one wasn’t quite what I expected, the forth was just awful, and the next couple…failed. So I began to doubt my own understanding of cooking principles after all these years of having achieved what I consider to be a mastery of culinary fundamentals. Well I didn’t go straight to that. First I wrote it all off as yet another beautiful book composed by people who might be great chefs but lousy authors. Then after looking at blogs like Alineaphile and Alinea At Home I thought wow, maybe it’s me! I wrote in my last blog that I’ve just about lost faith in “modern cuisine”, and that I have planned a trip to Chicago to give it one last look at the “laboratory” of the newly appointed Godfather of it all, Grant Achatz himself. Well that trip has come and gone and I will waste no more words before saying that I have become a believer! Our four day dining excursion to the Windy City began at Lou Malnati’s, the heart of Chicago style pizza. If you’re unfamiliar, Chicago pizza is made “deep dish” in essentially a cake pan out of a more crispy than chewy, buttery crust. Mounds of cheese go down first, then copious amounts of choice toppings (homemade sausage is the quintessential Chicago experience), and then zesty tomato sauce tops it all off. There’s no need to go into a great deal of detail here, just go to Malnati’s next time you’re in town. You’ll wait an hour for a table, and you won’t be sorry you did! Friday night we suited up and headed over to Charlie Trotter’s. I was there in 1997, and there were 2 menus offered, a Grand Tasting menu and a Vegetable menu. My memories from that meal were that there were 9 courses on the menu, we were served 13, and we left hungry. But I also remember that something like half of those courses were fish (I don’t eat fish), and though they were small and not what I would have ordered had I had a choice in the matter, they were pristine, simple, and perfect. The presentations looked like the ones in Chef Trotter’s books that had so inspired me for years previously, and each dish was a perfect representative of just plain well-made and identifiable cuisine. A pinnacle of American dining, and great food at it’s absolute peak of purity! 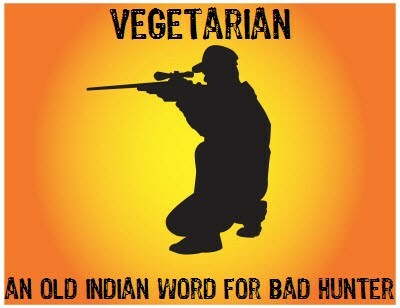 My companion at the time leaned more towards a vegetarian lifestyle, and therefore ordered the Vegetable menu. Probably helped by the fact that I find fish generally repulsive, I surprisingly favored the dishes on the veggie menu, and was frankly dazzled by the creativity and expertise that composed them. Good idea for Charlie! He has passed his prime. It’s not his fault. A lot has happened in American food in the last decade and a half, and Chicago has been right in the middle of it all. One thing about this business is that it is a business. I recently watched a documentary on NetFlix called “A Table In Heaven“, about Sirio Maccioni of Le Cirque and his family’s struggles and successes in closing one of New York City’s brightest culinary stars and reopening it twice. When I was in school Le Cirque was the Alinea of the western hemisphere. Daniel Boulud was the chef and Jacques Torres was the pastry chef. Both made names for themselves that still rival the best of the best in Euro-American cuisine. Yet for all Le Cirque was for so long things change and diners change with them. New names come, old names get lost in the mix. And throughout the documentary it is almost painful to watch the stubbornness of the old school mentality refusing to acquiesce to the new pulse of the food industry’s bloodstream. There are videos galore on YouTube about Alinea and Grant Achatz, one of which is a pretty cool recording of a planning session with Achatz and his chefs in which Achatz describes the visible evolution of styles that various big name chefs, including Trotter, have gone through during their careers. 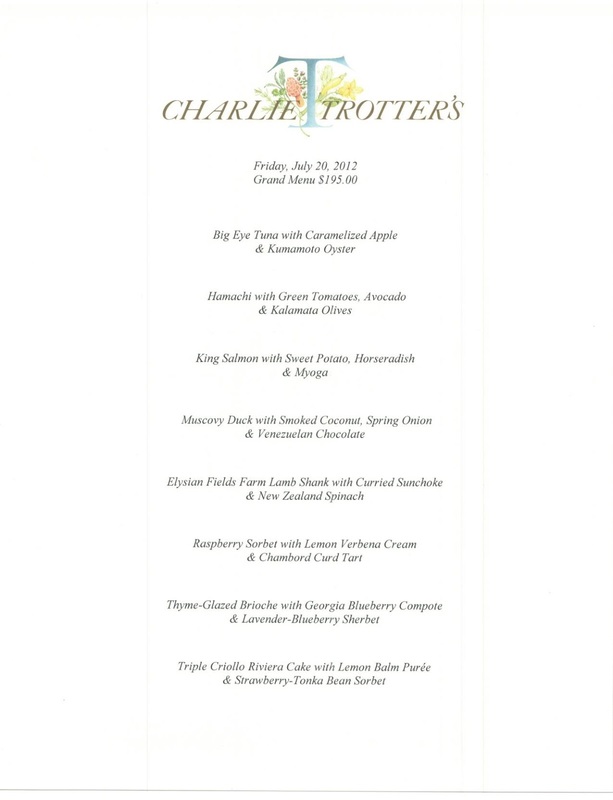 In my opinion Charlie Trotter, in a effort to appease his own need for professional growth while keeping his restaurant on the forefront of a viciously competitive market, has gone over the edge and inevitably lost the war. Based on past experience, and the desire to sample the entire gamut, we ordered a Grand Tasting and a Vegetable menu. Since eating there nearly 15 years ago I have learned that it’s okay to speak up and ask for less fish! The current menu of eight courses derives three of them from the sea, and a forth is lamb (which I also find repulsive). Our stately Spanish speaking captain was happy to arrange for me to have no fish and no lamb! Muchas Gracias! The first course was based around a marinated globe artichoke and was divine, despite the fact that the center-of-the-plate item was a chilled half of a baby artichoke somewhere between the size of a quarter and a half-dollar. Subsequent courses came and went, but none particularly shined. When it was all over Joan asked me how they manage to make money with all of the people working there and all of the amenities. “I’ll tell you how”, I responded. “They take a twelve ounce New York Strip steak, divide it 14 ways, and charge $200 for it”. Oh, and it was a bit overcooked at that.Throughout the meal the portions were tiny, and there were so many flavors on the plate that no one course had any true identity of its own. This is in no way the Trotter cuisine of the late 90’s. The menu listed eight courses and we got exactly eight courses. There was no unlisted amuse course, and mediocre mignardises were served along with dessert and the check as if to say “time to go”. The bill was just under $500. When I was there in ’97 I remember being lavished with attention and never seeing the same server twice. On our recent visit we had one captain, and we had to flag down support staff to ask for the coffee that we had ordered 15 minutes previously. My guess is that some staff was lost when they were told that they would be out of a job at the end of August. Countless online reviews proclaim identical scenarios and opinions. Sorry Charlie! Charlie Trotter’s Grand Tasting Menu get us out of our seats we were offered a tour of the kitchen. We didn’t even have to ask, and were told that every guest gets this tour. The Trotter kitchen is surprisingly small but immaculately outfitted. I remember when renovations were done to the kitchen in the mid-90’s. The event was covered by several publications, and touted as a million dollar renovation that rivaled every kitchen of the day. No freezers and minimal refrigeration meant that fresh products were brought in daily, and everyday started with a blank slate. Very impressive and unheard of in that period. The kitchen was still in amazing condition after 20 years of use, which is purely evidence of a true professional with incredible standards. A true inspiration to those of us that struggle with keeping our kitchens clean and well-maintained! When I say we got a tour of the kitchen I don’t mean we stopped at the door and peeked in. We were led by one of the restaurant’s cooks through the entire maze of the kitchen, down each production line, behind the stoves, over to the tight little pastry corner in the back, and did a dance with each and every one of the dozen or 15 twenty-something year old culinarians who were hard at work grinding out picture-perfect plates for a dining room full of patrons. Each one of those patrons will do that dance before the end of the night, and dealing with that must be the most challenging part of the job for Trotter’s cooks and chefs. God bless them each and every one. Mr. Trotter was not in attendance. Best wishes Charlie and staff. Each of them will likely land in a prominent position most anywhere they want to go with Chef Trotter’s name on their resumes. Oh, to be so lucky! Saturday night took us to the prize–the mecca. Alinea! Our cab almost missed the unassuming door which bears no signage whatsoever. In fact the only thing that tipped us off was a sign on the sidewalk that advertised their valet service and has their logo on it. A sharply dressed gentleman wielding an iPad stood in front of 8 foot high steel doors, and could easy have been mistaken for a member of the Secret Service. He took our names, input them into his device, and explained that lemonade was waiting just inside the door. He said that we should “enjoy the space”, and that there was a basket at the end of the hall in which to deposit the glasses when we were ready to proceed. Then he opened the door. A long, narrow hallway was appointed on both sides with louvered walls of descending height so as to give the illusion of an Alice In Wonderland shrinking room. The hall was barely lit with purple lights and the floor was made of grass. Actual panels of sod were rolled out so the hallway felt and smelled like summer–a perfect complement to the little scoops of frozen lemonade that nestled in over-sized glass globes floating around a galvanized tub of ice water like little plastic ducks at a carnival arcade. As we neared the end of the hall unsure of what to do next, and almost stunned by the surreality of our Wonderland surroundings, huge double doors abruptly and electronically whizzed open just like on Star Trek, and we stood in the doorway of the future of cuisine–about 25 years early. Two or three attendants were standing in the hallway waiting expressly for us, and took us up two flights of stairs to our table. Tabletops are made of black granite and are without tablecloths. It seems like there was something on the table, but I can’t recall what. It all happened so fast. Little pillows were issued to both of us upon which silverware was to be placed prior to each course. We were asked not to place soiled silverware back on them, but to leave them on our plates. We were offered a choice of mineral waters, and declining wine I accepted the offer of a house-crafted ginger soda which was served in a champagne flute and was divine. I requested on Joan’s behalf that she be brought a glass non-Chardonnay white wine of the captain’s choosing at an appropriate time. Several courses later our server decided that the appropriate time had come, and that it would also be a good time to switch me over to the house blueberry soda. We agreed, and both of us were brought a most exquisite accompaniment to the next couple of courses. I could go on for another 8 pages describing each course, but I won’t. I will say that of the 19 courses we had, seven of them were fish, and I loved each one! Something like half of them were raw, and none of them tasted like fish. In fact my favorite course was titled “Halibut Acting Like Agedashi Tofu“. A small block of what appeared to be tofu sat in the middle of a shallow bowl surrounded by 6 or 8 tiny, intricate garnishes, and our server brought what I later learned was a coffee siphon to the table and brewed a dashi infusion there before us, which was poured over the dish and also in a little Japanese cup for sipping throughout the course. This was the coolest thing I’ve ever seen, and in fact I went back to the hotel and ordered this exact piece of equipment for myself. It arrived two days after our return, and it produces the cleanest and most amazing cup of coffee I’ve ever had. Here is a video, and here is where to get one. Can’t say enough about this thing, except that I dread the day that I break it, as one fears the inevitable first dent in a new car! Through some type of culinary wizardry the halibut had the exact texture of well made firm tofu, and the crisp and clean flavor of something magical that still bewilders me as having been fish. The dashi offered magnificent umami, the garnishes were every one integral to the plate, and I will remember this dish to my dying day. 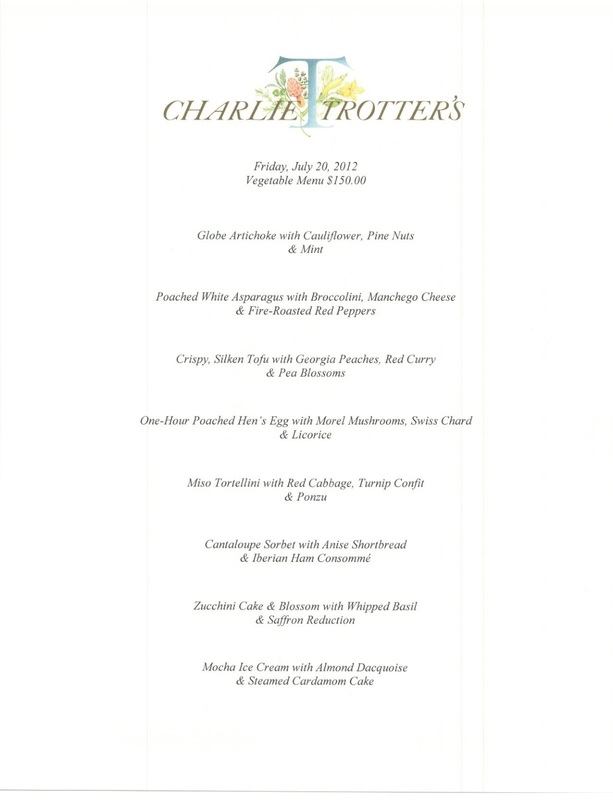 By the way, of the four courses that Charlie Trotter’s added to my menu instead of fish the previous evening, I can remember only three components of one of them. There were fresh morels filled with a mousse of black trumpet mushrooms, foie gras custard, truffles, the cool little dishes and utensils that Alinea has become known for; smoke, smells, nitrogen, dry ice, glass, steel, straws, cracks, sizzles, lights, and magic. There was amazement and laughter. There were flavors that we couldn’t get enough of, and some we will never forget! There was one dish that was stupid…a dish of lamb cooked three sublime ways that was accompanied by a plate of glass adorned with 60 different garnishes. Yes, sixty. We have no idea what a third of them were, and all but three of them were entirely unnecessary, but I’m pretty sure no one else is doing such a thing, so what the hell! To make up for the asinine lamb course we were brought the thing that apparently the whole of culinary America is a-buzz about–Apple Balloon. Oh My God! A helium-filled balloon made of sour apple flavored candy and tied with a string of apple leather is brought to the table with tweezers. The loose end of the string is tied around a silver “pin” which weights it to the table and keeps it from floating away. The diner either pops the balloon with the pin and eats it, or bites into it sucking out the helium, talking like one of the Chipmunks, giggling like school children, and then eating the amazingly delicious balloon. We opted for the sucking and giggling! Afterwards we were presented with warm, moist linen napkins to wipe any sticky remnants off of our faces. Then for the grand finale our table was cleared, cleaned, and sanitized. A silicon mat was rolled out, and a third dessert course was prepared and artistically displayed on the tabletop by one of the chefs. Strawberry powder went down, then English pea powder. Strawberry ice cream “dots” made by drizzling ice cream base into liquid nitrogen (like Dippin’ Dots for those familiar), and then English pea dots. Vanilla sauce, another sauce maybe…heck I lost track. The center-of-the-plate item was a white chocolate globe about half the size of a bowling ball and open on top. Liquid nitrogen was poured into it and we were momentarily engulfed by a cloud of chilled fog. Once the table was covered with various and sundry garnishes the chef lifted the globe about a foot above the table and dropped it. It cracked open and goodies spilled across the table like a pinata busting open. Inside were bits of strawberry ice cream, cotton candy, maybe there were some bits of frozen strawberries, and little quarter-sized doughnut holes filled with olive oil jam. Joan later said she wasn’t totally blown away by the whole thing, but she ate just as much as I did, and I thought it was pretty frickin’ delicious. Different, but delicious. Seriously, who else is doing this kind of stuff? When it was all over we stopped and watched the chaos in the kitchen for a few moments. I counted 18 young chefs asses-to-elbows in a space-age environment about 20′ by 30′. Chef Achatz was not one of them. He apparently was at one of his other properties in the city. As we left we were each presented with a copy of the menu in a black envelope. Until that moment we had not seen a menu, and never questioned what was to come next. We never saw a piece of bread, and we couldn’t eat another bite. I’ll be honest, I went into this experience with very low expectations, and anticipating a lot of over-marketed “Hollywood” fluff. Au contraire! Grant Achatz is probably the most brilliant and talented chef on the planet today. In fact there is Grant Achatz, and then there is every other chef lucky enough to have a job today.Throughout the entire experience at least one of 4 or 5 of the most knowledgeable and professional service staff I’ve ever known stood by our table and provided our every need without being asked. They explained each detail of each dish as if they had designed it themselves, and taught us without being annoying or intrusive how to enjoy it . And I will concede that in the matter of the recipes in the book working, I know absolutely nothing about food. I never did, and at this point in my life I never will. I’m not worthy! “I appreciate that people are so into food, and excited about eating at Alinea, to the point where it drives them to record it. Obviously these “foodies” are a large segment of our cliental, and the very people that help propel the awareness of food and dining. I certainly admit that the popularity of web based reviews and information has helped Alinea achieve a certain level of popularity, and ultimately some level of success has to be attributed to this. In fact, since the beginning we have embraced the web, often contributing to food blogs with things like the egullet project before the restaurant was even open. With the proliferation of food blogs and the almost competitive nature of the posters to delve further into detail with their reporting, coupled with the ease of capturing images and video with our phones, we have seen a very high rise in photo and videography in the restaurant. Documenting the food is one thing. I understand taking a photo in the kitchen with the chef after the meal to frame and hang in your office, perhaps of a particular course that you want to remember because it was so amazing, so you can remember the presentation, or even the manipulation of an ingredient in way you have never seen before. Taking it to the next level many people take pictures of every course and some even take photos of the wines as well. I don’t necessarily mind this, but I wonder why people so passionate about food would sacrifice the integrity of the courses, instead prioritizing the documentation. Courses get cold, or melt while the images are taken, and in extreme cases the intended effect of the dish is completely lost. A month ago a front of the house team member served the Hot Potato –Cold Potato to a blogger that was taking photos with a camera resting on a tripod. The server did their normal spiel, telling the guest the dish was intended to be consumed right away so the sensation of temperature contrast could be experienced. Instead they took a few minutes to move the course around on the table to find the right light, snapped several images, and then undoubtedly enjoyed….Warm Potato –Warm Potato. Not to mention the time that is added to the experience. Three extra minutes to take a photo is not much, but if you are eating 30 courses, you just added an hour and a half to your dinner. And what about the people in the restaurant that are there to –- eat? Or enjoy an evening out with a significant other, or even having a business dinner? Often we have guest request to move tables in the restaurant because they feel the sound of the shutter, the light produced by the auto focus assist, or the person’s actions are ruining their own experience. The bill including tip was just under $600. And we don’t regret one penny of it. I will remember every moment and every bite as vividly as I remember seeing The Who at the Meadowlands in 1989. * We respectfully didn’t take any pictures or video, but others have. All pictures and videos on this blog, with the exception of the scanned menus, are the work of others and can be found in various places on the internet. WOW!!! Almost felt like I was there! Alinea”s sounds amazing!!! Tell us more about EVERYTHING!! !